Nigel Irens RDI is a leading yacht designer. He is perhaps best known as designer of the Adventurer, a 35m trimaran motor yacht which completed a record-breaking circumnavigation in 1998, and of the record-breaking trimaran used by Ellen MacArthur to break the world record for solo circumnavigation in 2005. 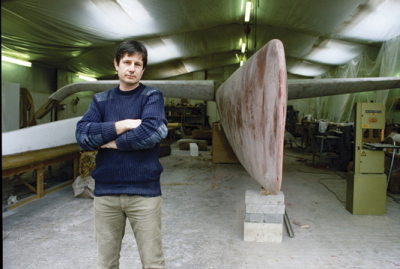 His design portfolio is wide-ranging, from record-breaking yachts to innovative cruising designs such as Roxane, and other sailing designs of traditional appearance such as the Westernman cutters – designed in association with Ed Burnett – or the launch Rangeboat, a 12m power craft also of traditional appearance. Typically, Irens’ designs synthesise traditional forms with modern materials and methods of construction, with Carbon fibre masts, laminated frames, and epoxied strip woodstrongly in evidence. The designer also in association with Ed Burnett, designed the King Alfred dinghy to be built by King Alfred School in London. The school has built three so far and use them to introduce students to dinghy cruising. Irens is perhaps particularly noteworthy for the simplicity, the efficiency, the essential elegance of his design. This entry was posted in All the Nigels and tagged Yacht Designers. Bookmark the permalink.